Ahead of the October 3rd Demo Day, service teams throughout North America were invited to the facility for hands-on technical workshops led by the team members at the factory who design and service the equipment. The three-day event was headlined by a pair of CBI 6800CT Horizontal Grinders, which have been engineered to improve on the 6800BT's revolutionary design. A 15 percent larger screening area wraps more than 190o around the rotor on the 6800CT, allowing production rates to surge beyond 200 tons an hour. Supported by a larger shaft and bearings and an optional 1200hp CAT C32, the engine powers the forged drum rotor through the toughest materials. 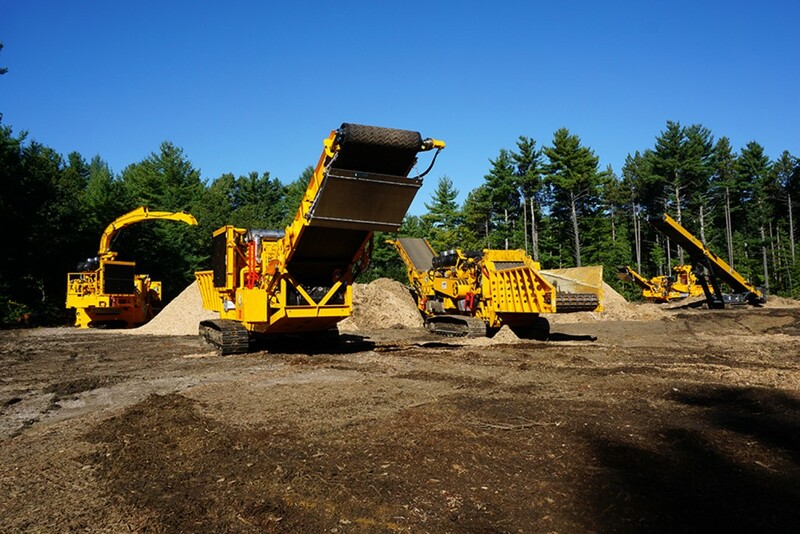 Built to process land clearing debris, pallets, clean industrial waste, stumps, logs, mulch, bark, shingles, and whole trees as fast as it can be loaded, the 6800CTs devoured entire trees and stacked the desired end-products in front of the crowd. A pair of 5800BT Horizontal Grinders processed high-volumes of material and demonstrated their powerful and portable designs. The newly available TSC 80T Stacking Conveyor was lined up in front of a 5800BT to show how end-users can optimize their current operations. Entire trees were loaded into the 7544 Flail & Disc Chipper combo, and guests watched as the machine perfectly debarked logs and blasted out a pile of premium quality chips. CBI also showcased the 6400 Horizontal Grinder's ability to process railroad ties contaminated with metal. Terex Ecotec's TDS 820 Slow Speed Shredder also processed railroad ties and pallets. Terex Ecotec's product lineup featured the TRS 550 Recycling Screen, the TTS 620T Trommel Screen, and the all-new Phoenix 1600 Trommel Screen. The Phoenix 1600 has been innovatively designed to provide excellent fuel efficiency and low operating costs. The large screening area guarantees high-volumes of precise production. The highly versatile trommel can easily screen a variety of material including topsoil, compost, sand and gravel, wood chips, and C&D waste. Woven mesh or heavy duty punch plate panels can be fitted to the drum ensuring all application requirements are met. CBI's 30th Anniversary Dinner was kicked off in style with the first-ever "Golden Grizzly Awards" recognizing excellence in the industry. Guests enjoyed a New England clam-bake style dinner during the award ceremony. Jasen Stock of the New Hampshire Timberland Owners Association was awarded the 2018 Community Impact Award for his work on reversing a biomass bill veto. Paul Campbell of Powerscreen of California and Hawaii was presented with the North American Ecotec Dealer of the Year Award. The team at Powerscreen of Florida accepted CBI's 2018 Dealer of the Year Award. Guests were then treated to live music and an afterparty in Portsmouth, New Hampshire. A full video recap of the 2018 Factory Forum can be found at this LINK>. Presenting the dealer of the year award to Powerscreen Florida. Paul Campbell of Powerscreen of California and Hawaii was presented with the North American Ecotec Dealer of the Year Award. Jasen Stock of the New Hampshire Timberland Owners Association was awarded the 2018 Community Impact Award for his work on reversing a biomass bill veto.